To put it bluntly, recently I have been feeling pretty crappy. I'm not going to go into much detail about why, as I would rather not share that with the internet, however lets say a mixture of things have left me feeling pretty helpless recently. Most than ever I have been feeling unsuccessful and incapable of success, or anything for that matter. After a while however we all get a bit fed up of feeling sorry for ourselves. I have decided I need to act in order for things to change. So I have decided to set myself some little goals to help me feel as though I have a chance of feeling accomplishment. I think recently I have let myself forget what I feel is really important as I have entered a spiral of sadness. 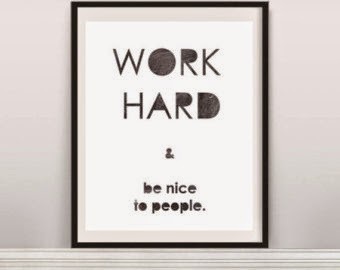 "Work hard and be nice to people" is a quote I like to try to live by. Yet recently I have been mopping and isolating myself, which has not been solving anything. From now on I am going to make an effort to put 150% into everything I do, whether that being writing regularly blogpost, or looking for a full time job I love, living a healthier lifestyle, as well as make an effort with friends and family, trying to make new friends, or even just being kind to people I see in passing. I want to become a person I am proud to be, and that is entirely within my control. It is time to embrace that.